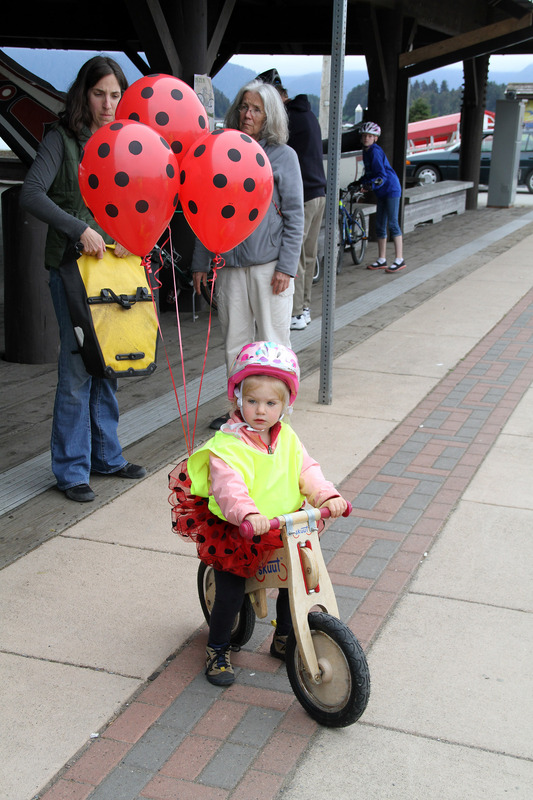 A young cyclist with her strider bike gets ready for the Sitka Community Bike Ride in May 2015. Children ages 3 and older who have never ridden a bike before are invited to a learn-to-ride bike clinic sponsored by Sitka Community Hospital and Sitka Community Schools. The clinic takes place from 2-4 p.m. on Saturday, Sept. 12, under the covered area at Keet Gooshi Heen Elementary School. This workshop is for children who are on training wheels, using a strider bike, have never ridden before, or are just learning to ride and want more confidence. Each participant will need a bike, a helmet (Sitka has a youth helmet ordinance for everybody age 18 or younger), and an adult to help them. The cost is $5 per child and $5 per adult. For more information or to register, please call Sitka Community Schools at 747-8670. 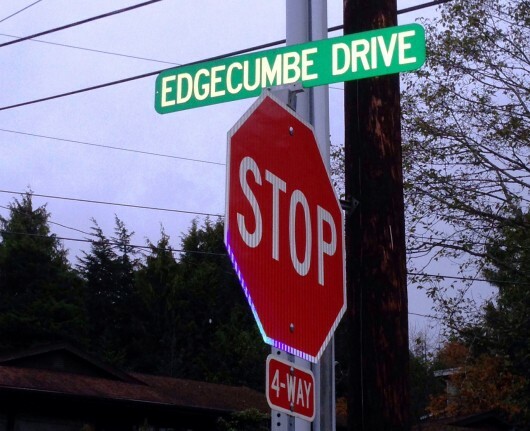 The Edgecumbe Drive Reconstruction Project is nearly ready for paving and completion, according to a Friday, Aug. 28, 2015, cover story in the Daily Sitka Sentinel (note, password required to view story on website). 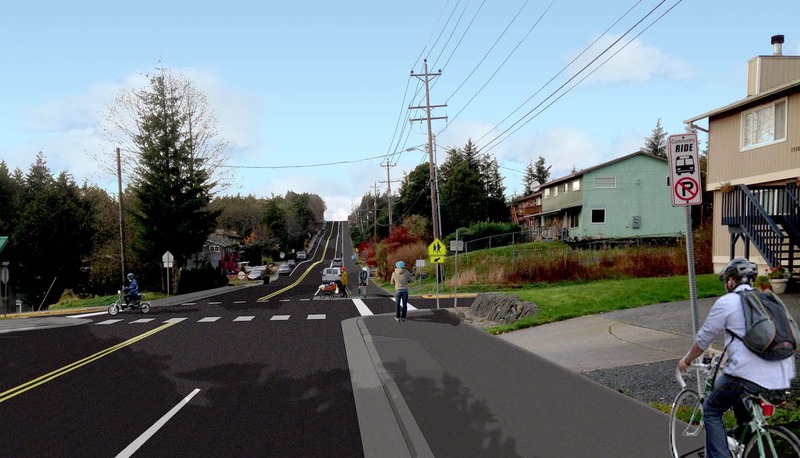 The article also highlighted the safer biking and walking facilities on the mile-long stretch of road, which include safer crosswalks, a multi-use path, and Sitka’s second roundabout (or third, if you count the one around St. Michael’s Russian Orthodox Cathedral). The project includes a new 10-foot-wide multi-use path on one side of the street for pedestrians and cyclists. The path is intended to provide a safe route for slow-moving bikes and pedestrians to travel. Edgecumbe Drive’s proximity to Keet Gooshi Heen Elementary School was a major driver in the decision to provide this pedestrian amenity. The new separated multi-use path replaces a narrow bike path on the downhill side of the roadway. The now-10-foot-wide path, which uses space from the narrowed traffic lanes, will be shared by cyclists and walkers. City and state law require bicyclists to ride on the right side of the road, with traffic, for safety reasons. Walkers are to walk on the left side of the road, opposing traffic, when there isn’t a sidewalk or multi-use path available. Cyclists traveling at traffic speed can use the road, but should ride on the right side. Longtin said paving on the path may start as soon as Saturday, if weather cooperates. Paving the main road will follow after the path is completed. Longtin told the Daily Sitka Sentinel that the construction crews can pave about 150 linear feet per hour, so the whole street should be paved within a week, depending on the weather. Another new feature is a roundabout near the top of Kimsham Street, near where Edgecumbe Drive, Washusetts, Kimsham, and private driveway meet. The roundabout was added to the plans about a month ago, and it replaces the five-way intersection originally in the plans. While there is some increased cost ($140,000 to the $4.6 million project), Longtin said the roundabout will be a safer alternative. Roundabouts reduce collisions by 37 percent and fatal wrecks by 90 percent compared to intersections controlled by stop signs, according to Federal Highway Administration studies. Other safety improvements from the project include bulb-outs at the Edgecumbe Drive crosswalks near Keet Gooshi Heen Elementary School (which narrow the traffic lanes near intersections to slow cars and make it a shorter distance for pedestrians to cross), and rectangular rapid-flash beacons to to warn drivers of the crosswalk. There also will be buttons on all four corners of the intersection that will light the beacons so drivers know somebody is about to use the crosswalk. These traffic lights are powered by solar panels designed for Sitka’s latitude and light conditions. 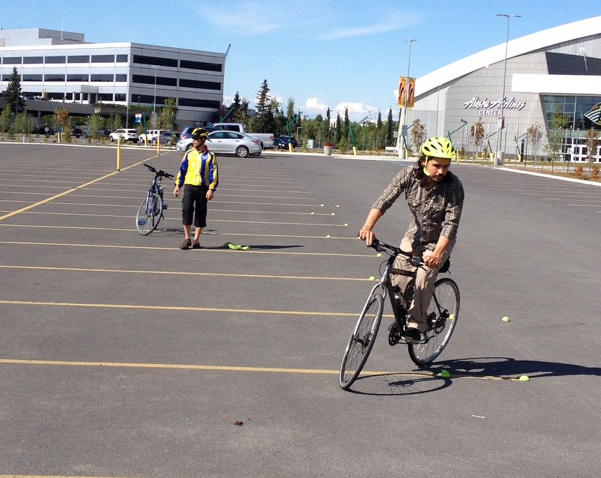 Two Sitka bicycle advocates — Doug Osborne and Bill Giant — recently completed a 2 1/2-day Alaska Bike ‘n’ Walk Safely training program in Anchorage. 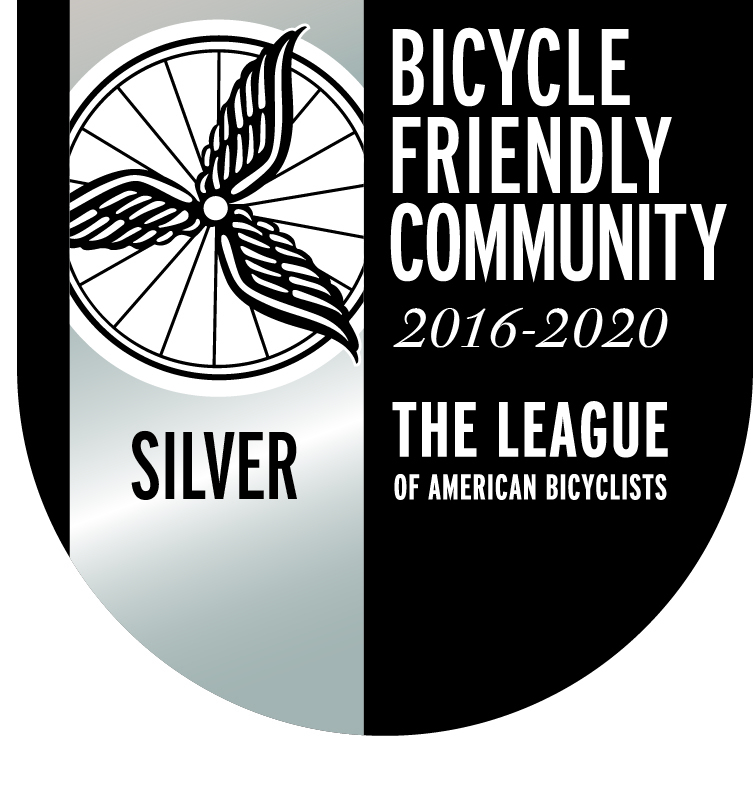 The program was taught by instructors with the League Certified Instructor (LCI) credential from the League of America Bicyclists. Completing the training, which included such classes as Traffic Skills 101, means Doug and Bill are better qualified to teach bike safety classes in Sitka. 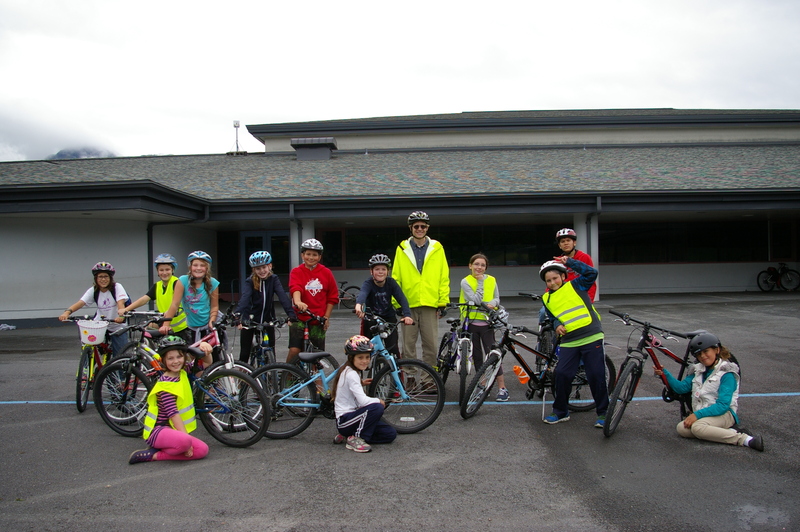 They recently hosted a summer bike camp for students in grades 3-6, and plan to offer classes through Sitka Community Hospital and Sitka Community Schools this year. Sitka Community Hospital and Sitka Community Schools recently hosted the first-ever bike camp for students going into grades 3-6. The hands-on camp took place on Monday-Thursday, Aug. 3-6, at Keet Gooshi Heen Elementary School. During the camp, the 13 participants had their bikes and helmets inspected for safety, learned about basic bike maintenance, and then learned basic bike safety skills. They also had group rides to the Moller Field track, Yellow Jersey Cycle Shop, and along Cross Trail. Osborne said response to the camp was positive, and he hopes there will be two week-long camps next summer. A slideshow of photos (courtesy of Wendy Fowler) is posted below.